Pourable Dressing, multiple uses. Made to a classic French Vinaigrette recipe with Dijon Mustard, vinegar, olive oil and seasoning. 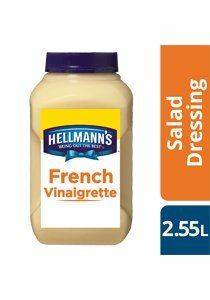 HELLMANN'S French Vinaigrette is a versatile dressing that goes with everything. Consistency. Saves time and provides excellent cost control. Seven varieties ensures there is good range of flavours to suit every menu and customer tastes. Highly versatile, ideal for multiple applications.